In a world of finite resources and complex environmental problems, we are faced with tough choices. Conservation Planning brings academic rigor to a pragmatic guidebook on making informed decisions about the way we navigate our relationship with the natural world. The authors draw on their extensive “hands-on” experience to provide an essential resource for practitioners, students, or researchers of conservation, natural resource management, or landscape planning and architecture. Conserving nature can be a complicated business whether in an urban environment, a production landscape dominated by agriculture or forestry, or more natural environments. Increasingly, planning and implementing a nature conservation or natural resource management project requires a range of skills across the ecological, social, economic, and political sciences. Conservation Planning provides the methods, tools, approaches, and case studies to plan a nature conservation project from inception to implementation and monitoring and evaluation. It draws on a wide range of disciplines and literature from conservation biology, landscape architecture, and land-use planning to decision science, natural resource economics, and sustainability. The book's primary audience is conservation scientists, planners, and practitioners in nongovernmental organizations; natural resource agency biologists and scientists; and professional landscape architects and land-use planners in both developed and developing nations throughout the world. With decades of experience as conservation planners, the authors have combined the fields of spatial planning (establishing priority places for conservation) and strategic planning into one overall planning approach. 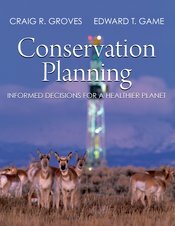 The book's underlying philosophy is that effective planning is really about making tough choices of where to allocate resources to achieve the conservation outcomes of a project, program, or conservation initiative. It should prove to be an essential guide to anyone involved in nature conservation writ large.